Year 2013 has really been mostly about indie polish for me and my blog. Last year around this time I placed my first orders for indies and received the bottles early Jan 2013. At that point I had no idea of how many indie polishes I’d end up swatching as the year went on. It’s been such exciting and fun nail polish year for me. I have met some awesome people online and tried many different brands. I started my year being an indie polish newbie and now I have about 170 bottles of indies and the count keeps going up. So now as we are almost at the end of the year I think it’s a good time to look back on how my indie polish addiction started, what were my first bottles and the memories they bring to mind. It all started with this, Different Dimension Soft Kitty, Warm Kitty. This was the very first indie polish order for me ever. I got this polish along with Social Suicide from Different Dimension’s store. This was also the first indie polish I ever tried on my nails. I love Big Bang Theory so I mostly got this one for the name and I also ended up really liking the soft and smooth look of this polish. Trying it on now after so many other indies I have tried, it brings back nice memories and I actually like it just as much as I did the first time I tried it. It was a great pick for my first indie. Awesome name, good and easy application and great quality. Another nice memory I have is from the New Year’s Eve night. I was just staying at home and relaxing. Got the kiddos to bed and opened a bottle of strawberry sparkling wine. I was babbling in Twitter with some other nail polish enthusiasts when The PolishAholic Jen posted a photo of an amazing combo of a creme and a glitter topper. The polishes were Elevation Polish Pic de Sotllo and Stay Behind, Catch a Wave. I was drooling at the photo and then quickly clicked myself to the Elevation Polish store (along with some other people) to buy those two polishes. I used both of the polishes but never actually did the combo I bought them for so I thought this would also be a good time to do that too. This is not the greatest photo. The amazing sparkle and glow this glitter has was quite hard to capture. Either way I’m still very happy I bought them and they also looked just as beautiful as I remembered. These two definitely hold a special place on my collection. The straw that broke the camel’s back when it comes to indies and a point of no turning back was Jindie Nails Barney Blew Up. I saw the first photos of this cutie and I just had to have it. Such a cute polish with an adorable name. Irresistible! I also bought some other indie polishes along with the ones mentioned here but when I look back to where it all started from, these are the first ones that come to mind. The ones that started this awesome adventure in indie polish land! 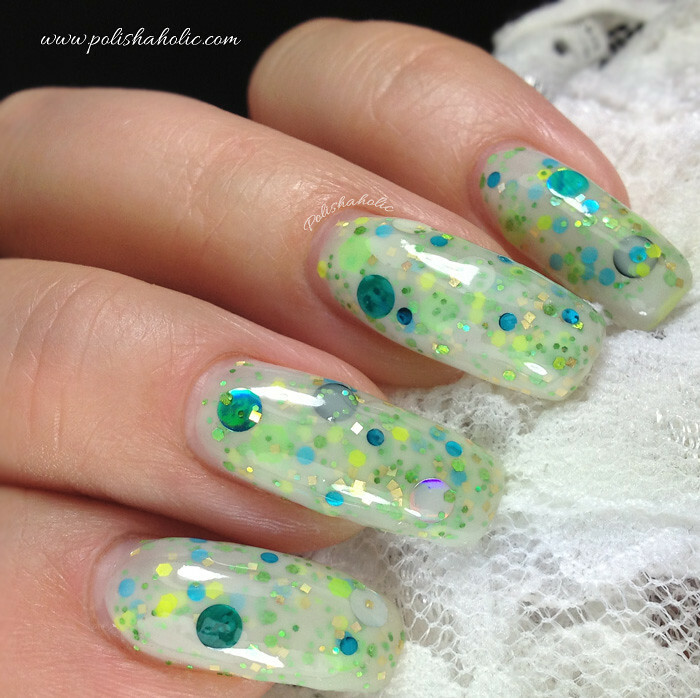 Today I have the last polish from Different Dimension Echoes collection for you. 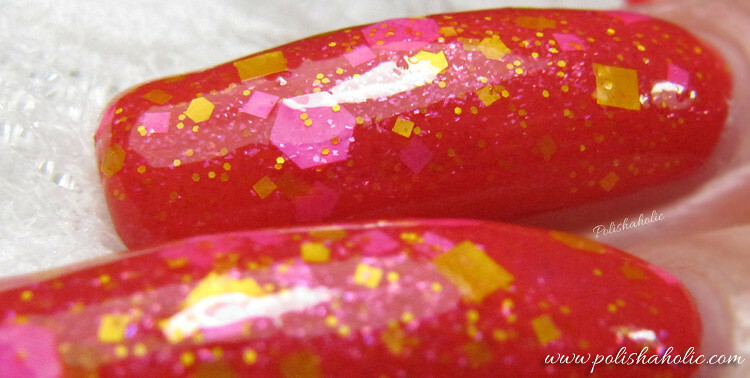 Another Brick In The Wall is a very pretty glitter topper that goes with a lot of different base colors. This has black, white and pink glitter in different sizes and shapes. There’s also holographic silver glitter that gives this polish a lovely subtle sparkle. For this manicure I used two coats of Essie First Timer, two coats of Another Brick In The Wall and G & G HK Girl top coat. Another Brick In The Wall applies well. All the glitter pieces come out easy enough as long as you turn the bottle upside down before application and shake it slightly to mix the bigger glitter pieces along with everything else. This applies nice and even so no need for Glitter Food to smooth it out. I have now shown you all the six shades from the gorgeous Echoes collection. If you missed some of the posts don’t worry. I’ll have a post up with all the shades and links to the original posts later today. ***Another Brick In The Wall was sent for review, Essie First Timer and HK Girl top coat purchased by me. Happy Saturday! 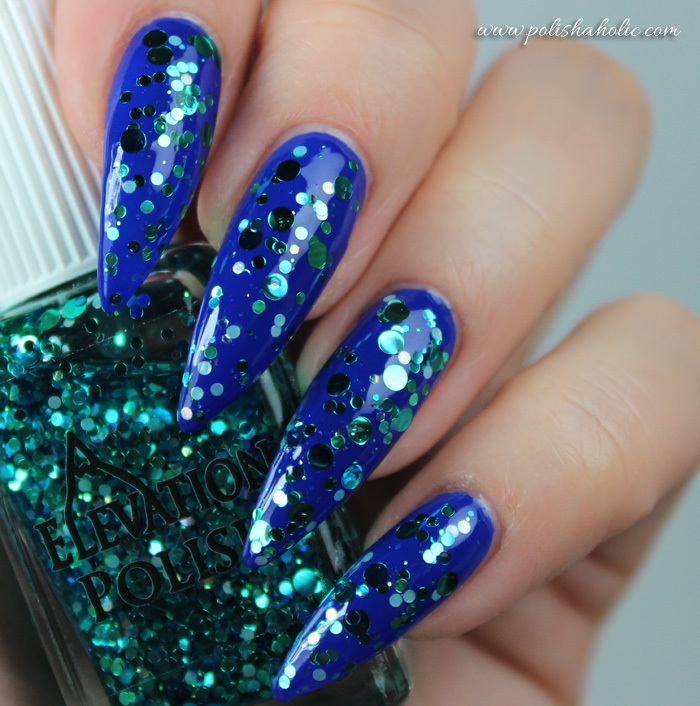 Today I have another gorgeous polish from the new Different Dimension Echoes collection. This is Hey You, a pale lilac crelly with pink and vibrant purple glitter. 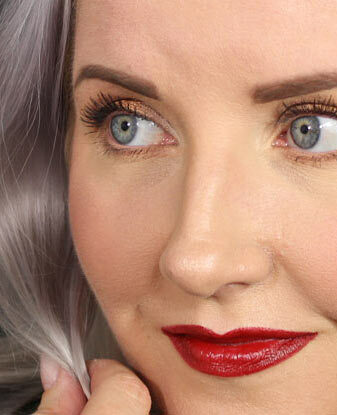 Hey You can be worn alone, without any base color or you can layer it over a lilac/purple creme to get more opaque result. In my opinion this wears beautifully alone. Crelly base is sheer enough to create a gorgeous sandwich effect. This is three thin coats of Hey You and G & G HK Girl top coat. Hey You applies really nice and smooth. I didn’t even need to use Glitter Food. Just one coat of top coat was enough. The shade of the polish is gorgeous and the purple glitter sparkles nicely. ***Hey You was sent for review, HK Girl top coat purchased by me. Happy hump day again! Today it’s already time for letter T (and maybe a time to start thinking about what our next challenge will be :P). So for letter T I chose a polish called Time. This is from the new Different Dimension Echoes collection. All the six shades in this collection are very beautiful and unique. Time is another gorgeous glitter topper you can use with a lot of different base colors. Again you can see on the photos how the holographic stars and big circles change color with the angle of the light giving this polish amazing sparkle and glow. This mani is two coats of China Glaze No Way Jose, two coats of Time and G & G HK Girl top coat. Time applies like your usual indie glitter bomb. I had no issues with it. You just have to remember to turn the bottle upside down before application to help the glitter come out of the bottle easier. Also remember to allow each coat to dry for a bit before applying the next coat. Otherwise you might start dragging the bigger glitters out of place. ***Time was sent for review. No Way Jose and HK Girl top coat purchased by me. Here’s my second blog post of today and as promised it’s another glitter topper from the gorgeous Different Dimension Echoes collection. Comfortably Numb has bright pink and yellow glitter on a clear base. This polish also has a gorgeous cold toned pink shimmer. Comfortably Numb is so much fun and it’s easy to layer with a lot of different base colors. Black would be the obvious choice along with a white base. I decided to try two other colors. First I layered it with this mornings Different Dimension Whatever manicure. This is two coats of Whatever, two thin coats of Comfortably Numb and G & G HK Girl top coat. I really like that combination. It’s bright and fun! But why stop here? Comfortably Numb is an awesome glitter bomb and I was just dying to see how it would look layered over a coral red creme so I took out my Wet n Wild Heatwave and created this combination. One coat of Wet n Wild Heatwave, two two thin coats of Comfortably Numb and G & G HK Girl top coat. Well I have to say this looks absolutely stunning over a coral base too and this combination just screams summer to me! Perfection! Comfortably Numb applies well. The result is nice and smooth so I didn’t even use Glitter Food with either manicure. Just don’t forget to turn the bottle upside down for a bit before application. That helps the bigger glitter pieces to come out of the bottle easier. 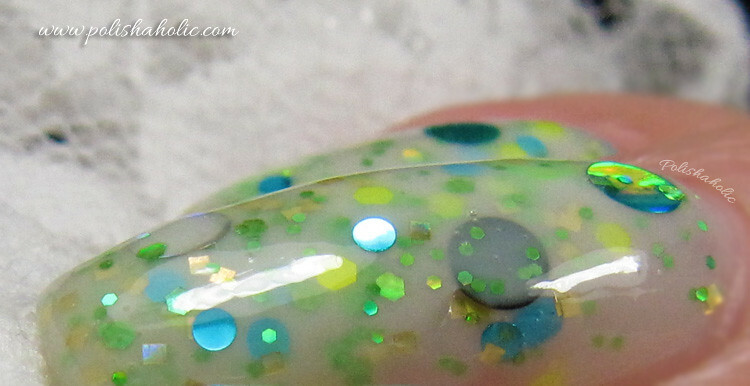 Different Dimension polishes can be bought from their Etsy-store, they ship internationally. Their polishes are also sold at Llarowe, Mei Mei’s Signatures, Edgy Polish and Ledouxnuage. ***Comfortably Numb was sent for review. Whatever and Heatwave purchased by me. A while back I ordered Different Dimension 80’s baby collection in mini size cos I couldn’t decide between the six shades and wanted them all. Now my only regret is that I didn’t buy the full size collection ;) The colors are awesome and quality of these polishes is excellent. 80’s baby is a collection of six neon polishes with scattered holo effect. This is two coats of Whatever and G & G HK Girl top coat. Whatever has an excellent formula. It’s opaque with two coats and dries fast. This is a perfect shade of purple for my skintone so I might actually have to get this polish in full size. Today I have another Different Dimension polish from their new Echoes collection. This is Wish You Were Here and this polish, ladies and gentlemen is so blindingly bling it might be lethal out in the sunlight ;) Camera couldn’t even capture all the sparkle this one has but trust me, it’s amazing! 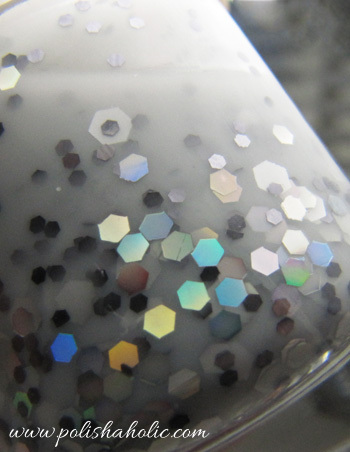 On the photos you can also see how the large holographic circle glitter changes color depending on the angle of the light. I have one blurred shot to show you the amazing rainbow colors this has. This is one coat of Color Club Where’s The Soiree? black creme, two thin coats of Wish You Were Here, a coat of Nail Pattern Boldness Glitter Food and HK Girl top coat. Wish You Were Here applies like your usual glitter bomb. I’m so used to these types of polishes nowadays that I had no issues with the application. I turned the bottle upside down for a bit before applying each coat and even the big circles came out just fine. This polish is absolutely stunning and it kinda gives my nails a certain galaxy manicure feeling. I got the new Echoes collection from Different Dimension. 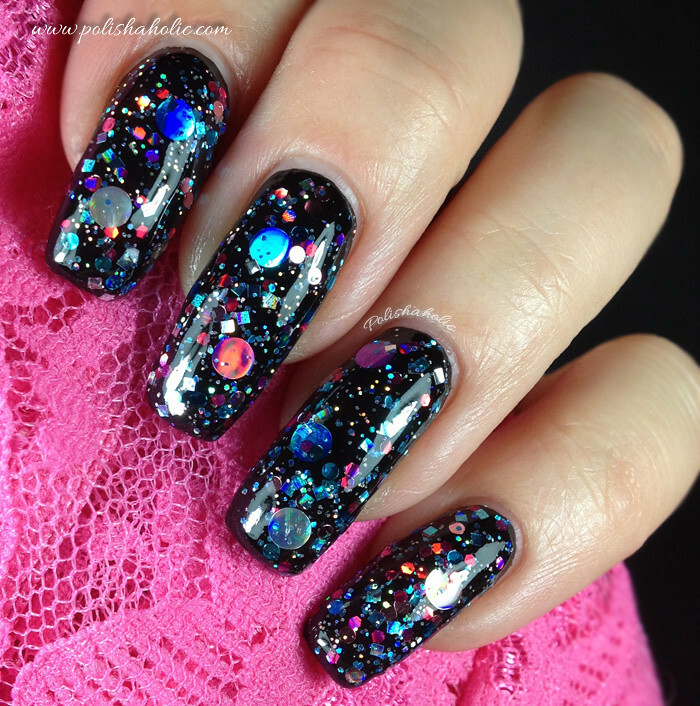 This collection has six amazing shades, both glitter toppers and polishes you can wear alone. Echoes is inspired by Pink Floyd. I’m a little ashamed to admit I don’t know too many Pink Floyd songs but this collection has actually inspired me to go listen to a few. I’ll show you these polishes one by one and in the end I’ll do a recap post with the whole collection. I’m gonna start with Money. This pale green crelly has a lot going on when it comes to glitter but everything goes together perfectly. I love green polish and the sparkling glitter in this polish made me stare at my nails and just sigh cos Money looked so beautiful. Money has a good formula and it was easy to apply smoothly. I turned the bottle upside down for a bit before application and between each coat to help to get the bigger glitter circles out. Crelly base on Money is thin and sheer enough to create an awesome sandwich effect. This polish has great depth and glow. This was three thin coats of Money, a coat of Nail Pattern Boldness Glitter Food and HK Girl Fast Drying + Super Shiny top coat. At the end of December I ordered two polishes from Different Dimension indie brand. I already showed you the first one Soft Kitty, Warm Kitty and here’s the other one, Social Suicide. 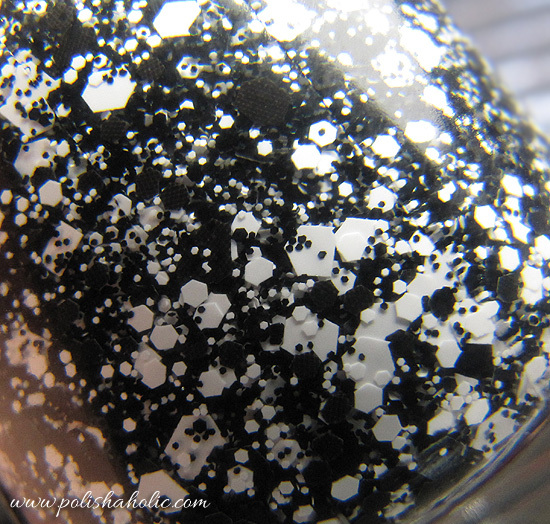 This is a clear base polish with a lot of different size and shape black and white glitter in it. Formula is excellent and this applies thin and smooth. You also don’t have to waste time and energy trying to fish the glitter out of the bottle. I decided to try this on top of yesterday’s China Glaze Def Defying manicure. The clear base makes this a perfect polish for layering. Black and white glitter also go well together with almost any color and it’s easy to control the amount of glitter by how many coats you apply. I really liked the effect this brought on my nails and next I’ll try layering it with pink polish. On this mani I used one coat of Social Suicide over China Glaze Def Defying and a coat of Inm Out The Door on top of everything. You can buy Different Dimension polishes from their Etsy store. It only took a bit over a week for my polishes to arrive counting from the date of ordering and I think it’s pretty darn fast since I live in Finland, not US. the bottle to get something out. Here’s my first indie polish, Different Dimension Soft Kitty, Warm Kitty. I love Big Bang Theory and I just had to get this polish for it’s name too. 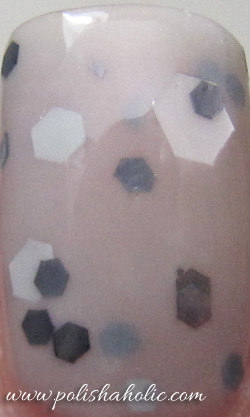 This is milky grey jelly with different size white, grey and holographic silver hexglitter. The polish lives up to it’s name and the result is soft and smooth, sandwich effect-y finish. On this mani I used two coats of base coat, three coats of Soft Kitty, Warm Kitty and Inm Out The Door Fast Drying Top Coat. Dry time for three coats was very fast with Inm top coat. I ordered my polish from here.